This NCLEX review will discuss stroke (CVA), also called cerebrovascular accident. As a nursing student, you must be familiar with this neuro disease along with how to provide care to a patient experiencing this condition. Don’t forget to take the stroke quiz. What is a stroke? It is a condition that develops when blood rich in oxygen can NOT reach brain cells (due to either a blockage or bleeding). This causes the brain cells to die. Embolism: where a clot has left a part of the body (example the heart: this can happen due to a heart valve problem or atrial fibrillation). The clot develops in the heart and travels to the brain, which stops blood flow. 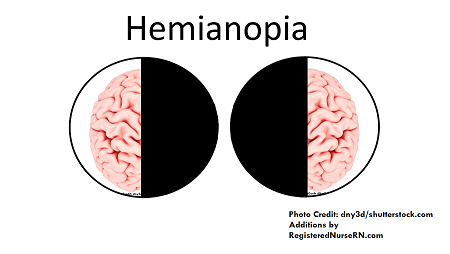 –Hemorrhagic: this occurs when there is bleeding in the brain due to a break in a blood vessel. Therefore, no blood will perfuse to the brain cells. In addition, this can lead to excessive swelling from the leakage of blood in the brain. Causes of this type of stroke includes: rupture of a brain aneurysm, uncontrolled hypertension, or aging blood vessels (older age). 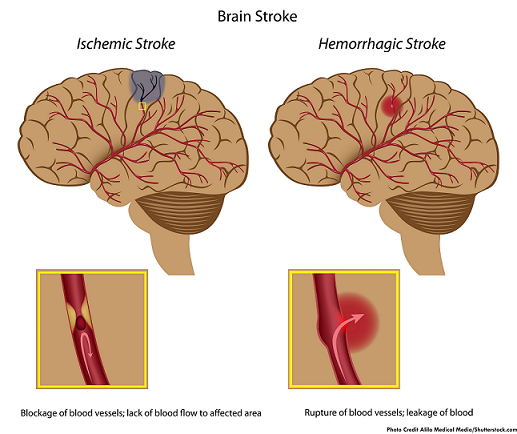 -TIA (transient ischemic attack) also called a mini-stroke. This is where signs and symptoms of a stroke occurs but last only a few minutes to hours and resolves. It is a warning signs an impending stroke may occur. If this occurs the patient needs to seek treatment. To understand strokes, let’s talk about the BRAIN”S function and anatomy! Blood supply to the brain? 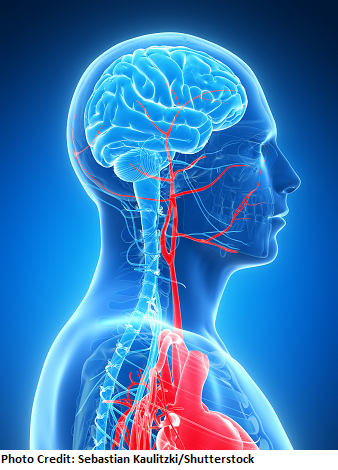 The blood supply to the brain comes for the carotid and vertebral arteries, which then branch into other arteries that feed the brain. If any of these areas of the artery become blocked or burst open it decreases the blood supply to the brain cells. Brain cells are very sensitive and within 5 minutes these cells start to become damaged, and the damage can become IRREVERSIBLE. The cells in the brain control how our body functions and depending on where the cells are located they are responsible for specific functions. 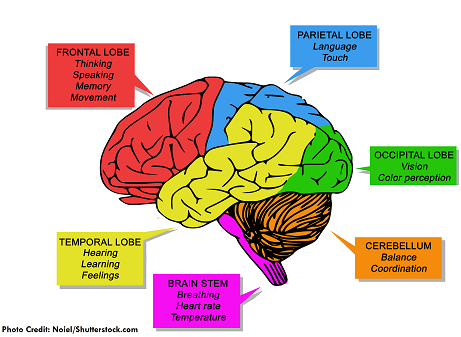 Therefore, it is super important to be familiar with the function of each lobe and the difference between the right and left hemispheres of the brain. The right side of the brain is the CREATIVE side while the left side is the LOGICAL side. 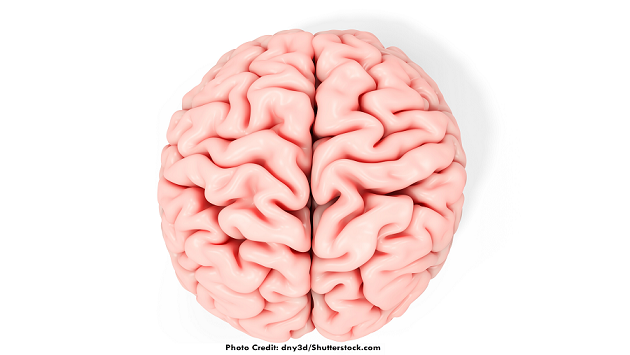 If a patient has right side brain damage, what do you think the patient will experience? So, as you can see when there is brain cell death in a certain area it will cause specific signs and symptoms. The amount of brain damage depends on how long it took for blood to return to the affected brain cells. 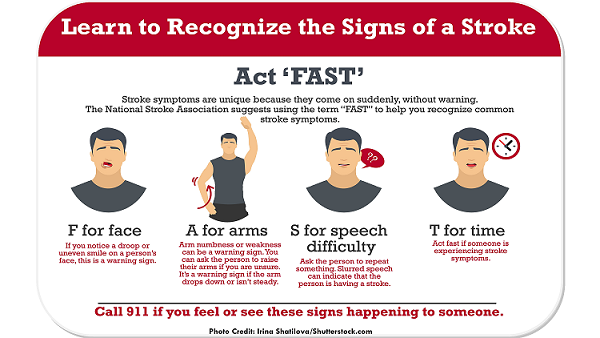 **National Stroke Association recommends using the mnemonic F.A.S.T. to help assess for signs and symptoms quickly. remember these terms because exams love to ask you about them. Mixed Aphasia: combination of the two types of aphasia. Global Aphasia: complete inability to understand speech or produce it. Apraxia: can’t perform voluntarily movements (winking/moving arm to scratch an itch) even though muscles function is normal. tPA (tissue plasminogen activator): for ischemia strokes ONLY not hemorrhagic! How does it work? It dissolves the clot within the blood vessel by activating the protein that causes fibrinolysis. REMEMBER: It must be given within 3 hours from the onset of stroke symptoms. It can be given 3 to 4.5 hours after onset IF strict criteria is met. Communication is key (just because the patient can’t communicate doesn’t mean they have a mental deficit). They just can’t get it out and it takes them time. The nurse’s role is to help bridge the gap and make it less frustrating for the patient. Stroke care is a multidisciplinary approach: need to involve family as much as possible because they will be providing care when patient is discharged. In addition, it is important to be always be communicating with the speech language pathologist, physical therapy, occupational therapy etc. assist with eating and monitor for pouching of food in cheek (on the affected side). This increases risk of aspiration. Have patient tuck in chin to their chest while swallowing. Watch for neglect syndrome: (tends to happen in right side brain damage). The patient is at risk for injury because patient ignores the affected side. Remind patient to use and touch both sides of body daily (must make a conscious effort to do so). Educate the patient about the importance of turning head side-to-side to prevent injuring the affected side.